"No Goku, I own you one" "Think about it, I'm really too soft!" The above info came from BH Ouji (aka Big Hamster), and was edited by yours truly (contact me). The image came from The Gohan Vegeta Site. 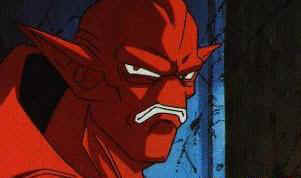 Suu Shinron is the Four Star Dragon that Pan and Kakarotto fought. He knocked Pan off but didn't kill her. This was the reason why Kakarotto spared his life later. Meanwhile, when those two battle, San Shinron (Suu Shinron's big brother) appears and tells his brother to finish Kakarotto off. He declines, and San Shinron played dirty when Kakarotto attacks with a 10x (Jubai) Kamehameha (first when using Pan which he knocked and then using his brother as shields). After a while, Kakarotto gets mad at him so San Shinron begs him for mercy (like Raditz did long ago), and promises him to give him the Dragon Ball. He then blinds Kakarotto and tries to attack, but Kakarotto kills him with a Dragon Fist. Suu Shinron then gives Kakarotto an eye medicine to heal his eyes up. But Ii Shinron appeared, destroyed the bottle, and kills Suu Shinron. Suu Shinron later returns when Kakarotto swallows the Four Star Dragon Ball. He plans to kill Ii Shinron inside his heat barrier, but Ii Shinron tricked him and poor Suu Shinron died again. 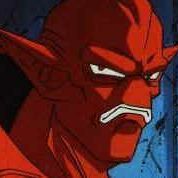 Suu Shinron is my favorite Evil Dragon and he isn't so much evil at all (maybe due to the fact that he was born from the four star Dragon Ball, which was a gift to Kakarotto from his Grandpa Gohan?). The above description came from BH Ouji (aka Big Hamster), and was edited by yours truly (contact me).